Flat earthers deny the existence of space so they need to deny the existence of satellites also. The flat earth doctrine is that everything we think is being done by satellites is done by towers on the ground, like cell phone towers. They think there are no GPS satellites, no weather satellites, no communications satellites. They have no idea how things work. They do not know a satellite dish is a parabolic reflector that focuses on a very small point in the direction it is pointed at… Flat earthers see all these satellite dishes pointing up into the sky and they sit down and watch the cable television coming from their satellite dish and say it is all done with ground based towers. But my dear flat earther your parabolic satellite dish is not pointing towards a ground-based tower, your satellite dish is aimed at a point in the sky above the equator and it is are receiving a radio signal from that point which is being relayed from a ground station and your dish can also transmit a signal to that point which will be relayed to the ground station. So it is an absolutely established fact that we can point our satellite dishes up into the sky, aim them at satellites, and send and receive radio communications from the satellites. So there is no question. Satellite dishes are not pointing at ground based towers and because they are not pointing at ground based towers they can not be getting their signals from or transmitting to ground based towers. They are sending their signals and receiving their signals from somewhere in the sky, typically somewhere directly above the equator. That is why, if you travel, you will see at the equator satellite dishes are pointing almost directly up into the sky, because typically the geosynchronous communications satellites are directly above the equator. And as you travel away from the equator north or south the further away you get from the equator the satellite dishes are set at a lower angle. If we say pointing directly up into the sky is at a 180 degree angle as you come towards the north or south pole you have to reduce the angle of your satellite dish down to almost 90 degrees to have it still point at the satellite above the equator. At some point before 60 degrees latitude it becomes impossible or very difficult to receive and transmit to satellites stationed over the equator because the angle of the dish becomes so low that the signal gets blocked by hills and trees, etc. 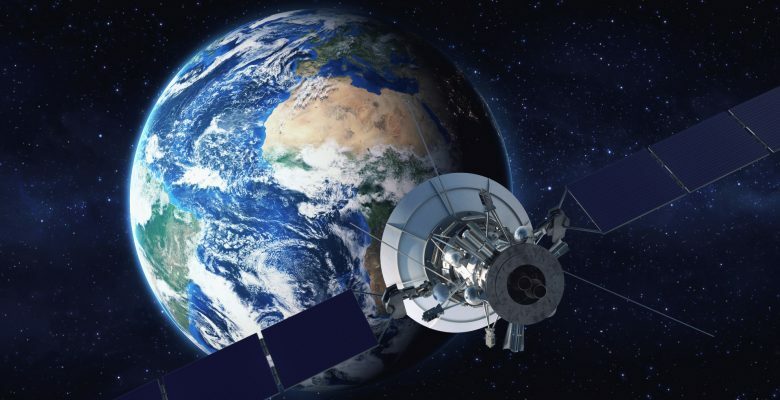 Satellites in low earth orbit, generally used for weather, mapping, surveillance, etc. These are generally not higher than 250 miles. They do not have a full view of the earth, they can only photograph narrow strips which can be pasted together to produce a composite image of the earth projected on a globe, or projected on a flat plane also. We do have cameras on these low earth orbit satellites and the images are available online. We are using both types of satellites and they are working for sure. Of course there is a possibility everything is not as they tell us it is, however, it is certainly possible to put objects in low earth orbit and to put instruments, cameras, etc on them and these objects travel on predictable orbits. Many of the low earth satellites are transmitting radio signals which can be picked up and tracked by anyone who wants to point an antenna at them as they pass by overhead in the sky. And we are getting the images and data from these low-earth satellites and it is being used by scientists all over the world daily for many uses. There are aspects to geosynchronous satellites which could be suspicious. It is very suspicious that they have thousands of these geosynchronous satellites and have had them for 50 years or more but have never put a camera on them to give us a live high definition streaming video of the earth from space. That would be great. And would be so easy, just put a video camera on one of these geosynchronous satellites? There are, of course, geosynchronous satellites, typically weather satellites which do have cameras and do provide some imagery which is posted on the internet. The most prominent being the United States GEOS weather satelites. But it is unclear if these are actual photographs or if they are compilations of data produced sourced through various instruments and plotted onto the globe by supercomputers. Because geosynchronous satellites are typically used only to relay communications they are mostly passive. It means the satellite is not really actually doing anything at all. It is just an antenna in space. You point your parabolic antenna at that point in space and transmit to it, the ground station points their parabolic antenna at the same point in space you are pointing at and receives the signal you are transmitting to that point in space. Then, using a different frequency, the ground station transmits its reply to you back up to that same point in space, your antenna picks that up from the same point in space and you have your communication. So if it was possible to reflect a radio signal off a point in space then there would be no need of geosynchronous satellites for satellite communication. So there is a good chance they have discovered some property of a location in space 22,236 miles above the equator where you can transmit a radio signal to and focus another antenna at the same location in space from a different location on earth and receive that signal. In that case they would still need to have the communication gear for the satellite but it would be installed in the ground station, not in space. If you could reflect the radio signal in space like this then you wouldn’t need a satellite in the sky at all, you could do everything from the ground station. 178) People claim Google Earth somehow proves the ball model without realizing that Google Earth is simply a composite program of images taken from high-altitude planes and street-level car-cameras superimposed onto a CGI model of a ball Earth.